Higher seas, sinking cities and more people mean worsening impacts from storms and floods. And the frequency of these events is increasing, too. Recorded floods and severe storms in Southeast Asia have risen sixfold, from fewer than 20 from 1960 to 1969 to nearly 120 from 2000 to 2008, according to an Asian Development Bank study. So a sixfold increase in severe storms in SE Asia: Take a guess what annual percent increase in storms accounted for that sixfold change. The answer is 6%. Six percent per year doesn’t sound like much. But when it’s applied relentlessly–and that is the nature of an exponential increase–the change seems small at first, but at some point, the change can be overwhelming. Food for thought regarding the many exponential chart patterns shown over time at Thundering Heard. We are living in unprecedented times on many fronts. As everyone knows, that ice sheet stores enough ice to raise the global sea level about 7 meters (24 feet). As it gets more permeable, it becomes less stable. As I said, food for thought. Especially during the last year, the animal kingdom has shown signs of extreme duress. In 2012, nearly 10,100 people were affected by dog bites from April to December. Number went up to 16,000 in 2013. 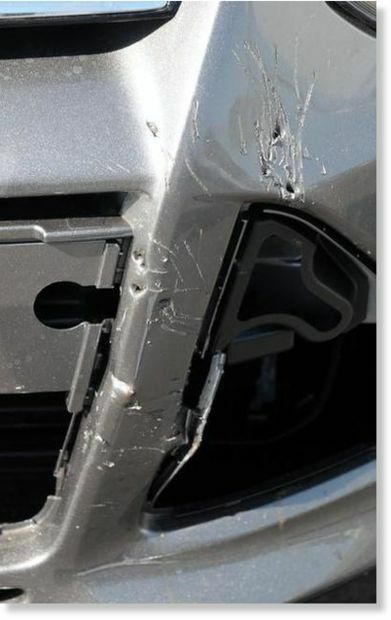 Damage done by an animal is seen Tuesday on a Ford Focus at Heritage Ford in Modesto. The car had some damage done to it by an animal. Three vehicles at the dealership have scratches and bite marks on them. The front grille of the Focus was torn completely off. Millions of fish around the planet are mysteriously dying… but why? I have a lot more links for animals attacking humans (especially coyotes, jackals, wild dogs, and wild boars, but also including owls, foxes, and otters), but I’ll spare you having to scroll past them, and pass to another category: regional animal die-offs across many species. At an ocean research station known as Station M, located 145 miles out to sea between the Californian cities of Santa Barbara and Monterey, Huffard and her colleague Ken Smith observed a sharp uptick in the amount of dead sea life drifting to the ocean floor. The masses of dead sea plankton, jellyfish, feces and other oceanic matter that typically only cover about 1 percent of the ocean floor were found to now be covering about 98 percent of it — and multiple other stations located throughout the Pacific have since reported similar figures. Highly radioactive water at the plant is seeping into the earth and mixing with ground water. Experts estimate around 200 tons of contaminated ground water are leaking into the ocean each day. Mass die-offs of certain animals has increased in frequency every year for seven decades, according to a new study. Researchers found that such events, which can kill more than 90 per cent of a population, are increasing among birds, fish and marine invertebrates. So, what are the reasons for this dreadful state of affairs. There are several, to be sure. describes how the mass stranding of 100 whales was connected with exploration by ExxonMobil. The Obama administration has sided with energy developers over environmentalists, approving the use of underwater blasts of sound to pinpoint oil and gas deposits in federal Atlantic Ocean waters. Perhaps the deflationary wave that has been sent to the world economy–the price of oil, at $45.29 per barrel today, has now been cut by 58% since June, natural gas prices have also been crashing (again), and interest rates are now negative in several countries–will provide the kindness of some relief for the creatures of the ocean deep, kindness that humanity has been unwilling to provide. What was missing was the cries of the seabirds which, on all previous similar voyages, had surrounded the boat. The birds were missing because the fish were missing. Exactly 10 years before, when Newcastle yachtsman Ivan Macfadyen had sailed exactly the same course from Melbourne to Osaka, all he’d had to do to catch a fish from the ocean between Brisbane and Japan was throw out a baited line. “There was not one of the 28 days on that portion of the trip when we didn’t catch a good-sized fish to cook up and eat with some rice,” Macfadyen recalled. But this time, on that whole long leg of sea journey, the total catch was two. If that sounds depressing, it only got worse. The next leg of the long voyage was from Osaka to San Francisco and for most of that trip the desolation was tinged with nauseous horror and a degree of fear. “After we left Japan, it felt as if the ocean itself was dead,” Macfadyen said. “We hardly saw any living things. We saw one whale, sort of rolling helplessly on the surface with what looked like a big tumour on its head. It was pretty sickening. In place of the missing life was garbage in astounding volumes. The industrial overfishing, the chemical pollution, the radiation, the acidification, the garbage…We truly are trying to “break” the oceans. 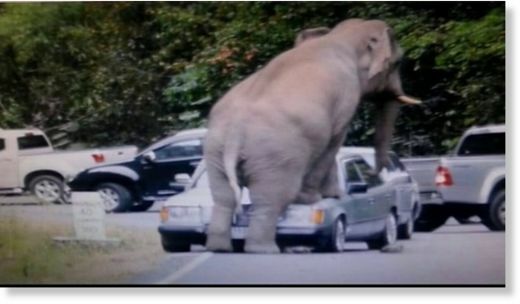 As far as those rampaging elephants are concerned, can you blame them? Ivory Poaching At Critical Levels: Elephants On Path To Extinction By 2020? If humans were more rational, perhaps we would be trying to understand elephants’ telepathy and empathy rather than killing them for their tusks. Neurotoxic pesticides blamed for the decline of honeybees is also harming butterflies, worms, fish, and birds, and contaminating habitats worldwide which are crucial for food production and wildlife, scientists have concluded after a four-year assessment. 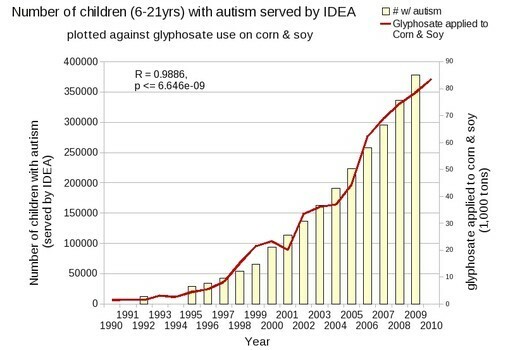 we’re poisoning lots of species. And what about the migratory animals, both birds and sea creatures, who are losing their way? It turns out that some migratory birds are stymied when they encounter the edges of a city, industrial area, or campus. The electromagnetic emanations from these places disturb the workings of these birds’ navigation systems. Given that experiments have shown that the emanations from wifi routers can kill plants, I guess it isn’t surprising that our electromagnetics are disturbing animals. And probably us as well. And how can I fail to mention how we treat animals raised for food, putting them in cramped industrial settings and cages prior to their slaughter. Were it not for strong doses of antibiotics–which end up on our plates–most of these animals would die of disease. Is the growing 2014 trend of animal attacks on people an indication that they have started to fight back? We better hope not. If the animal kingdom ever decided to fight with us, we’d likely all be dead within months. Without the ceaseless cleanup of our environment by insects, worms, algae, bacteria, fungi, etc., we would find ourselves living in waste. As it is, these beings constantly process billions of tons of materials into forms useful for us. And we often pay them back by trying to exterminate them, interested in the endless “growth, growth, growth” chant of our so-called leaders who definitely have no understanding of the exponential function. Everyone has heard of the “lost animal syndrome” where there is a notable increase in pets getting lost before earthquakes. Are the animal agitations and disorientations a reaction to current Earth changes, or to an impending mega-Earth change. If it’s the latter, one might shudder to think what that would be. Are the animals who normally remain deep in the oceans reacting to increases in methane and volcanic materials coming from the ocean floor? Perhaps. Or are the animal attacks on humans simply the animals reflecting our own emotional and mental states? A recent NPR article highlights the truly frightening environmental effect of monoculture. NPR commentator and science writer Craig Childs decided to replicate a photo project by David Liittschwager, a portrait photographer who spent years traveling the world dropping one-cubic-foot metal frames into gardens, streams, parks, forests, and oceans, photographing anything and everything that entered the frame. Around the world, his camera captured thousands of plants, animals, and insects within the cubes, with entirely different “worlds” of plants and animals living as little as a few feet away from each other. Childs recruited a friend, and together they set out to replicate Littschwager’s “critter census” in a corn field in Grundy County, Iowa. But whereas Littschwager’s camera captured several dozens of insects wherever he set up his frames, Childs and friend found nothing stirring among the genetically engineered corn stalks on the 600 acre farm in Iowa, where they spent an entire weekend crawling around on the ground. No signs of life with the exception of an isolated spider, a single red mite, and a couple grasshoppers. The good news, the very good news, is that more and more people (permaculturists, organic growers, channelers of information from the devic realm in places like Findhorn and Perelandra, occultists, etc.) are realizing that nature provides a physical and energetic abundance that is currently well beyond our comprehension and perception; that we should be working with the processes, energies, and intelligences that provide that abundance rather than working against them; and that our own evolution depends directly on our turning our interaction with the natural kingdoms from one of exploitation and devastation to one of great respect and harmony. In this exponential accelerating trend lies great hope for us all. This entry was posted in Earth changes, Financial System and tagged animal kingdom by Thundering Heard. Bookmark the permalink.